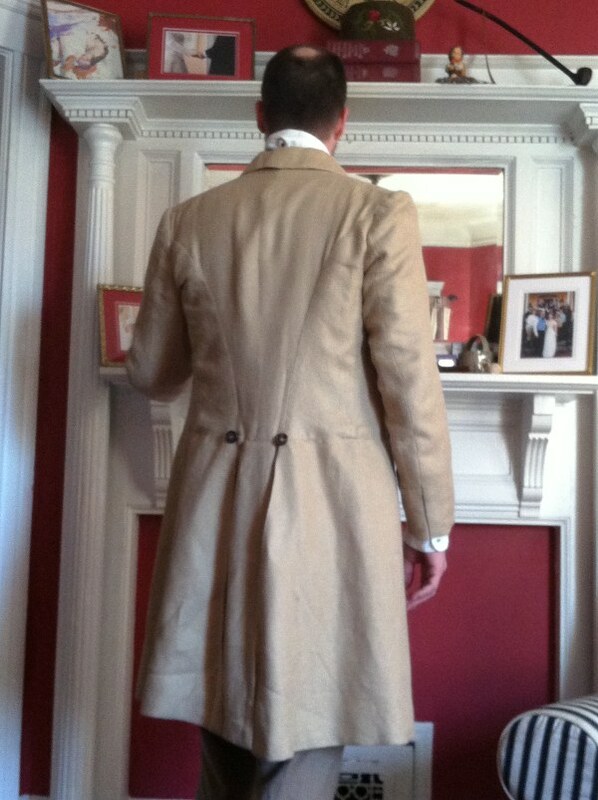 Finally, I'm posting about the finished frock coat! 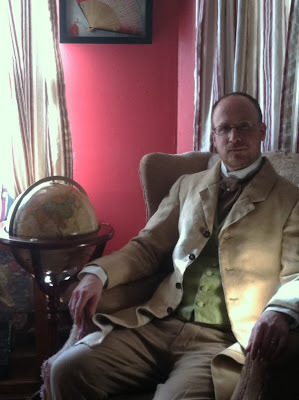 I actually finished a while ago, but what with other projects I'm working on (non-Victorian clothing) I haven't gotten around to posting these or putting on the finished frock coat for a photograph. 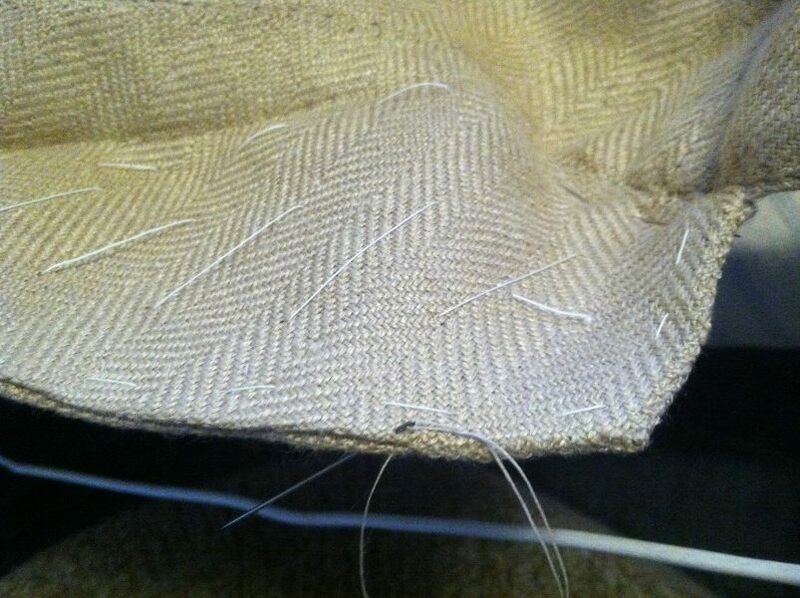 Here I'm sewing the collar front to the collar back (the back has all the basting showing below. The stitch pulls the edges together into one piece, as you can see. The front slightly overlaps the back, which the stitch then sort of wraps down to join. Does that make sense? The finished collar, and revers. The draft I used had a dart to shape the revers, which I'm not entirely sure about, but you can see it where it meets the collar below. The sleeve joining the body at the shoulder. There are no shoulder pads in this coat, but there are sleeve heads. I think this is a nice smooth join, without too much fuss. It was a lot of fuss to make it work. 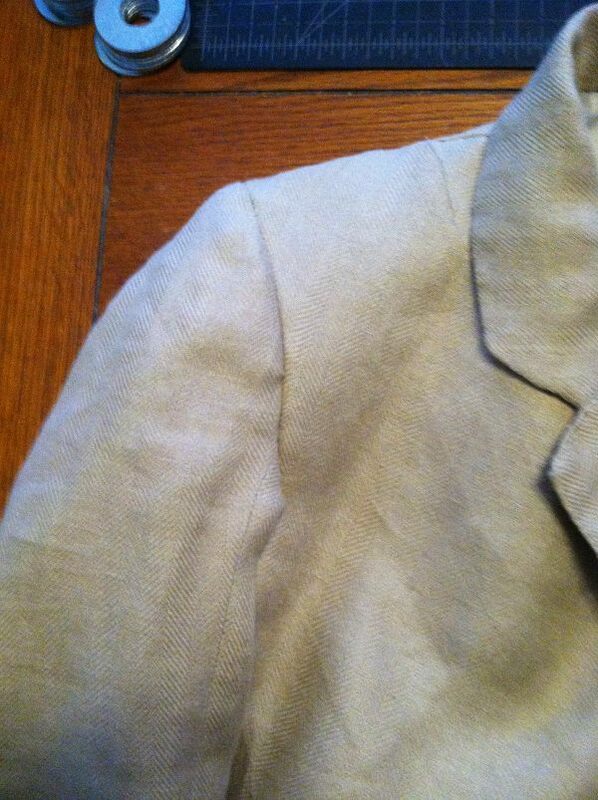 The waist buttonhole is worked into the seam between the body and the skirt. There are bar tacks (which you can't see, apparently) strengthening the ends of the buttonhole. Finishing a buttonhole. You can see the length of four-cord I made of twisted buttonhole silk. Just four strands of thread twisted until they twist themselves into a rope. I've basted the buttonhole closed to work on the next one. I'll leave this basting in place until I've pressed the fronts one last time. All dressed up. 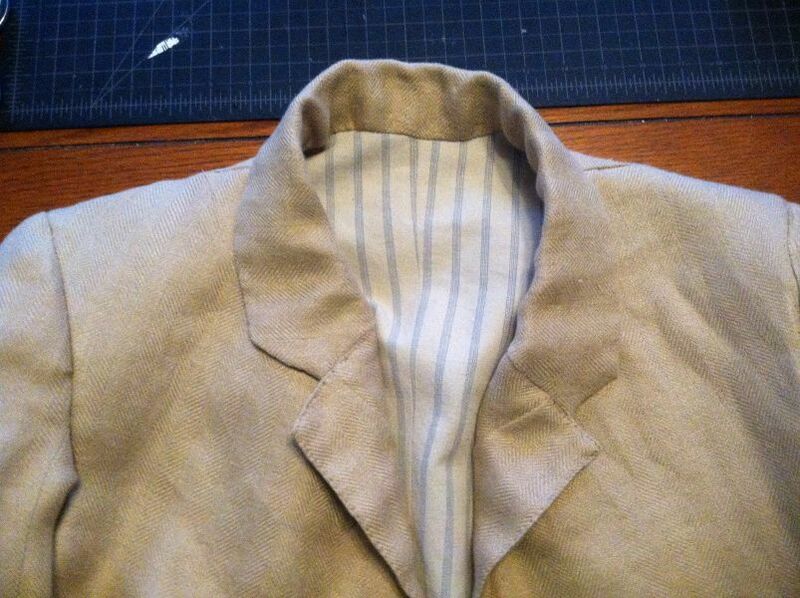 You've seen me make this shirt, trousers, waistcoat, and frock coat. The trousers need a serious pressing. Oops. I'm not sure what's going on with the shirt collar here. The frock coat looks a little bunchy too, but that's because it isn't buttoned up. When it's buttoned it's a perfect fit - a true body coat. It looks awesome! Utterly jealous of your tailoring skills. Like you step out of another time. Fantastic coat. I'd love to make one myself some time. Thanks for showing all your work. That's really impressive. Love the buttonholes. wonderful! your work is stunning. Very nice! Especially appreciate and like your beautiful button holes..... impeccable!! Wow, this is gorgeous. You inspire me to make hand worked buttonholes. I have the silk thread but not the courage. So impressive and really, quite beautiful! I've learned so much from your site, stumbling upon it by accident :) Thank you for sharing your talent and your skills! What pattern drafts did you use for your coat from the Mens Garments book? 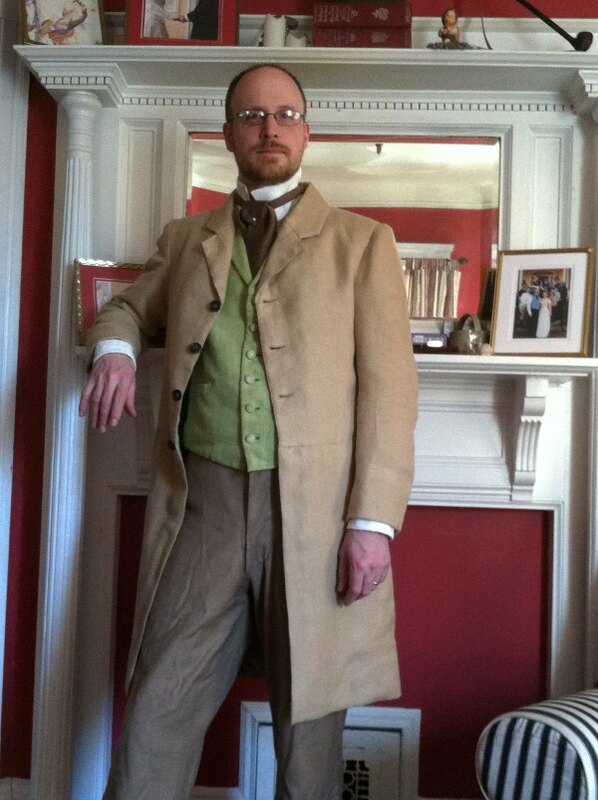 I used a combination of the single-breasted frock coat, 1860-1870s, and the double-breasted frock coat, 1880-1900. Most of all I used the sleeves from the later period to avoid the "baggy elbows" of the '60s. The two drafts are very similar, differing mostly in the cut of the skirts for a trimmer waist in the later period. What would you do to modify the 1860s-1870s single breasted frock coat for a more 1850s look?